INDIANAPOLIS — Cell biologist Benjamin J. Perrin of the School of Science at Indiana University-Purdue University Indianapolis is advancing knowledge of age-related hearing loss with the goal of informing possible therapeutic cell-regeneration approaches to the often-debilitating problem. Perrin's work is supported by a new $1.9 million five-year grant from the National Institute on Deafness and Other Communication Disorders. 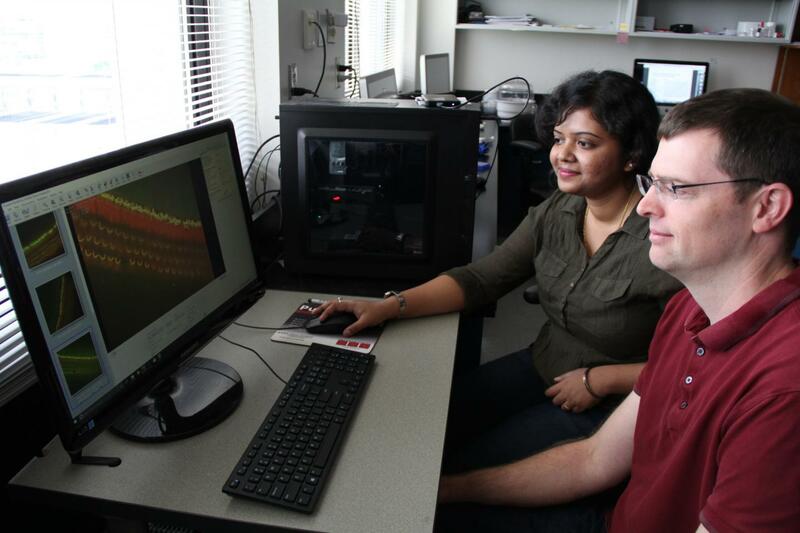 Perrin is tackling the problem at the cellular level by exploring the function of the portion of the sensory cells in the inner ear that are responsible for detecting sound waves. These bundles of rod-like protrusions, called stereocilia, bend as sound hits them, opening ion channels. When stereocilia work properly, they convert sound waves into electric signals that are transmitted to the body's neurons, thus enabling one to hear speech, music and other sound. Perrin envisions the development of a maintenance-of-living-cells approach — remodeling or regrowing a tiny piece of the cell before the whole cell is dead — rather than totally replacing them. t under Perrin's tutelage, conducting sophisticated experiments on mouse sensory cells, which are very similar to human sensory cells, and analyzing the data obtained from those experiments.